It is an honor and a privilege to serve the citizens of Grainger County as General Sessions and Juvenile Judge. I am very grateful and humbled by the opportunity to serve the people of Grainger County in this position. 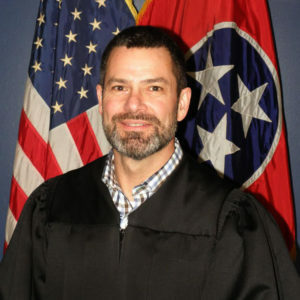 As General Sessions Judge, I preside over criminal cases, both felony and misdemeanor, from the initial appearance through the preliminary hearing. In misdemeanor cases, which are cases in which the maximum jail sentence is eleven months and twenty-nine days, the court has jurisdiction to accept pleas, conduct trials in some circumstances and to impose sentences. In addition, the court has jurisdiction in civil cases where the amount in controversy is $25,000.00 or less and in cases involving landlord/tenant disputes, actions to recover personal property and orders of protection. As Juvenile Judge, I preside over cases of juvenile delinquency, unruly child petitions, truancy and cases involving dependent, neglected or abused children. It is my intent to serve the people of Grainger County with honesty and integrity and to treat all persons coming into our court with fairness and respect while applying the law fairly and consistently to ensure that the interests of justice are served. Elected Office: General Sessions and Juvenile Court Judge on August 7, 2014.